The painting was written in 1915. The artist depicted the best day of the year – his own birthday. Before us are two – a woman and a man. Happiness overwhelms the person, he comes off the ground. It seems that he suddenly felt cramped in such a small room. He rises and swims already somewhere under the ceiling. He throws back the head of a woman and very gently whispers something in her ear. Now they both fly up and hover from the ceiling. They so want to fly right through the glass into a huge world that knows no boundaries. A huge sky and majestic clouds beckon them and call to themselves. Chagall has a distinctive style, as if the pictures were created by a child. This picture shows it most clearly. The creation is imbued with the mood of the holiday. But at the same time, the riddle has been preserved, which invariably permeates the entire work of the painter. Imagine that the male figure would not be distorted. Then the picture certainly would not have attracted such attention. We would take only one glance at her, nothing more. The artist uses such an unusual technique as much as possible to catch our attention. We want to consider the work in detail. Chagall subtly perceives and deeply understands the details. We notice them only because it leads us to this unusual image of a man. 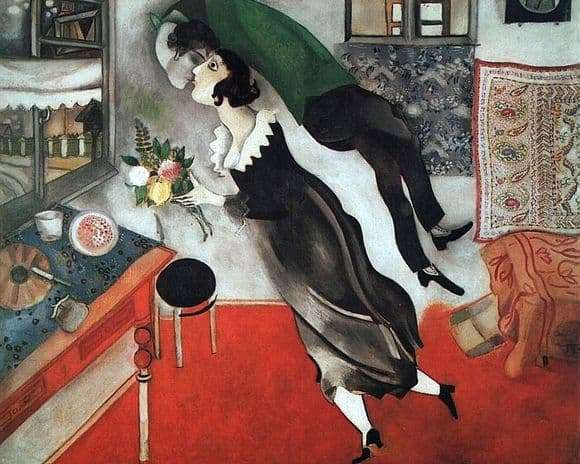 One of the birthdays was remembered by Chagall. It is no coincidence that he draws all the details in detail. It is also worth paying attention to the fancy image that hangs directly above the bed. No less impressive is the technique of deliberate obscuring, which is used by the artist to simply depict a seemingly simple wall. We can penetrate the world of Chagall, look at all through his eyes. This is his understanding of love and family. It is striking the uniqueness of the style of the painter. It is no coincidence that the painting is one of the favorite works of the author, which is appreciated by true connoisseurs of his work.